Low Carb Quiche Recipes | Single Serve! 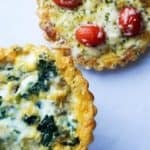 In this post I am bringing you not just one, but two different Low Carb Quiche recipes and they are dynamite! I only intended on making one, but when Matthew and I had differing opinions on what the fillings should be I decided that two had to be made that Sunday morning! Low Carb Snacks – Two Delicious Options! Matthew is a huge fan of tomato, but he’s taken a step back from eating them by the handful since starting keto. So, any chance where he gets to use a small amount, especially when heating them in the oven or on the stove top, he takes advantage of it. However, I myself can’t deny how well the three ingredients he chose complement one another. The tomato, mozzarella and bacon sing together perfectly! It is a pretty classic trio after all! The crunch from the bacon, fatty goodness from the cheese and the burst of the tomato in your mouth all at once is too good to be true… but it is true! In the second quiche I wanted to speak to old vegetarian in me. I wanted to create a recipe that would be satisfying to even the meatiest of all meat lovers! 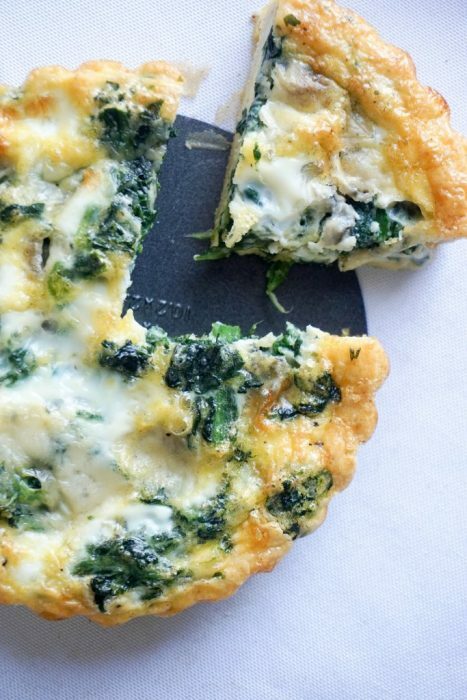 And, my low carb spinach quiche takes the cake. Gorgonzola has a strong taste and smell, but when cooked into an egg it’s creamy and melts in your mouth. The spinach not only adds beautiful color to the quiche, but brings on a subtle flavor that works extremely well with the strong gorgonzola. 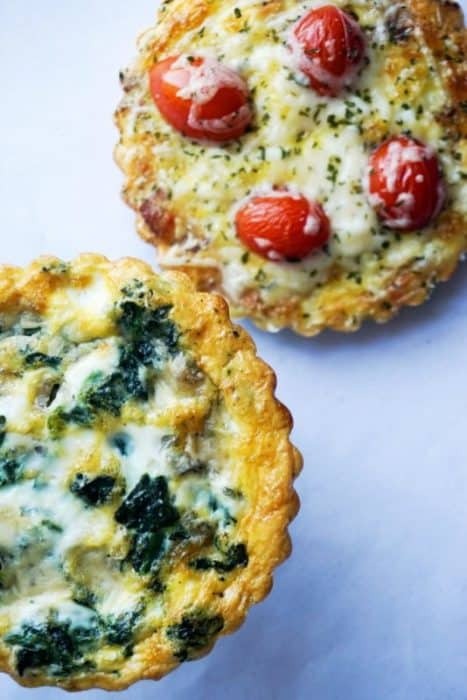 These low carb quiches are perfect for any meal or snack of the day, but we enjoy them most to start our day off right in a low carb, high fat manner. The easy assembly of plopping on all the ingredients and just pouring the egg over the low carb crust makes it an easy meal! If you’re not a fan of breakfast quiches or eggs, or you are just looking for something to change it up give our Macro Cakes or Cauliflower Hash Browns a try! Either way, we’ve got you covered for a low carb breakfast recipe that is guaranteed to satisfy every time! 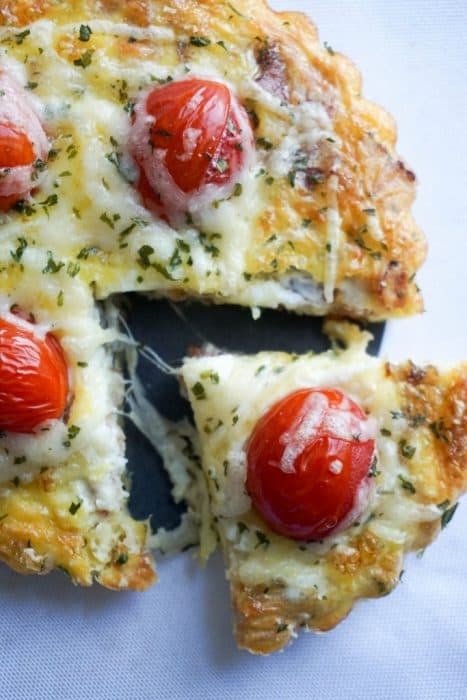 Combine all ingredients for crust (almond flour, parmesan, egg and salt). Mix well until dough is formed. Split dough into two pieces and form in the bottom or two quiche pans. This recipe makes enough crust for 2, 4 inch diameter quiche pans. Using a fork or knife makes scores in dough so the crust doesn't bubble in the oven. Bake at 325 for 7 minutes. Allow to cool. Layer cooked bacon, mozzarella cheese and cherub tomatoes on bottom or cooled crust. Combine egg and heavy whipping cream and pour onto crust and fillings. Season with salt and pepper. Bake at 350 for 22-25 minutes or until fully cooked through. Layer cooked thawed spinach and gorgonzola on bottom or cooled crust. Combine two eggs and heavy whipping cream and pour over crust and fillings. Season with salt and pepper.